The Eremopezidae occur in the late Eocene of the Jebel Qatrani Formation (Fayum) in Egypt. 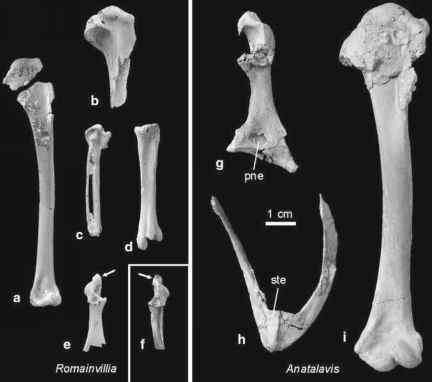 The original description of the rhea-sized Eremopezus eocaenus Andrews, 1904 was based on the distal end of a tibiotarsus (Andrews 1904). Subsequently, Lambrecht (1929a) reported a fragmentary tarsometatarsus from the same locality, which formed the holotype of Stromeria fajumensis. Lambrecht (1929a) erroneously (Rasmussen et al. 2001) considered the specimen to be of early Oligocene age, and assumed a close relationship to the Madagascan Aepyornithidae. Rasmussen et al. (1987) already supposed that these two fossils belong to a single species, but synonymy of E. eocaenus and S. fajumensis could not be proven until Rasmussen et al. (2001) identified new and better preserved specimens from the Fayum. Still, however, E. eocaenus is only known from hindlimb elements. The distal end of the tibiotarsus lacks an ossified supratendinal bridge, which seems to have been the main reason why the species was associated with palaeognathous birds. Madagascar split from Africa at a very early date (Jurassic) and the presence of a giant flightless bird on Africa during the early Tertiary therefore makes it a less likely ancestor for aepyornithids than would be a volant species. If the aepyornithid ancestor flew to Madagascar, it was no close kin of Eremopez,us. Rasmussen et al. (2001) even questioned palaeognathous affinities of Eremopezus, and the phylogenetic affinities of this remarkable bird probably cannot be conclusively resolved without further material. At least the distal tibiotarsus, however, is indeed quite similar to that of ratites. Just because of its geographic distribution and possible ratite affinities, it is tempting to assume that Eremopezus is a stem group representative of the Struthionidae. But even though the tarsometatarsus of Eremopezus has a somewhat reduced trochlea for the second toe, which is completely lost in extant Struthionidae, its morphology is otherwise very different.